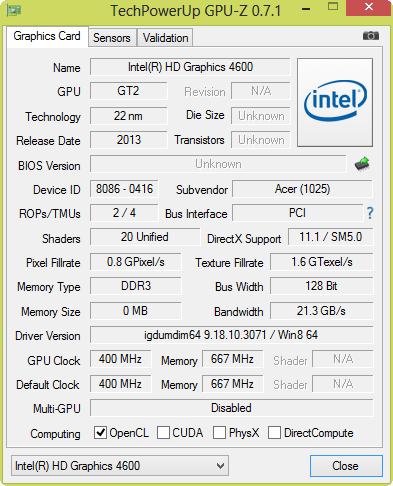 4 Cores, 4 Threads @3.4GHz, Haswell. 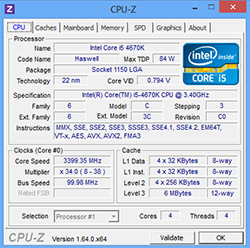 The Intel Core i5-4670K averaged 20.7% lower than the peak scores attained by the group leaders. This is an excellent result which ranks the Intel Core i5-4670K near the top of the comparison list. The range of scores (95th - 5th percentile) for the Intel Core i5-4670K is 35.5%. This is a relatively wide range which indicates that the Intel Core i5-4670K performs inconsistently under varying real world conditions. Typical Core i5-4670K Builds (Compare 9,867 builds) See popular component choices, score breakdowns and rankings. With Haswell a new socket is required – this will probably exasperate some, especially if they have only just moved to Intel Z77. But with this new LGA 1150 socket, there is still compatibility with LGA115X CPU coolers and of course dual DDR3 memory kits which should help lower the cost for those wanting to jump ship. You get more performance and a better platform at roughly the same prices as Ivy Bridge a year ago. It’s not enough to convince folks who just bought a PC over the past year or two to upgrade again, but if you are upgrading from even a 3 year old machine the performance gains will be significant. Doing it's job even tough we are in 2019 i can still play all of the games with decent settings , a perfect cpu ! I have this CPU since 2013, and I like it a lot! Been using it since 2013. Still waiting for a worthy succesor in its class. Bought this thing over 4 years ago, still going strong and it's core unlocked. Not high price, not bad graphics, 4 cores and no overheat problem. Very good performance and overclockability for a reasonable price. Great performance for price (at time of purchase 3 years ago, now the 6600k eclipses it). Overclocking with stock cooler not recommended. Takes everything I throw at it in normal desktop use and gaming and has no problem with single player gaming, unless you plan on running multiple game servers simultaneously while playing a game on the system... Otherwise all around very good CPU.